Nancy had been sailing for 28 years, but after only two years in, Kelly said, “Let’s go cruising,” something that Nancy had always wanted to do. Quitting her job was a huge step for Kelly. It was even more challenging on Nancy’s part since she was a professional golfer with a client base that had been with her for over 25 years. But the cruising lifestyle proved to be a strong calling for her. They were looking forward to the simplicity of life. 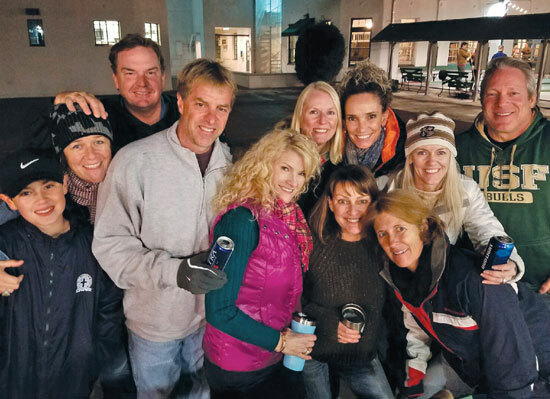 In 2015, they sold the 56′ sailboat, and their house was already rented out. So, in a sense, they were homeless. They rented a van in Norfolk, Virginia, put all the contents of the boat into it, and went back to Houston. They stayed with family and started their search for another boat. The search for the ideal boat went on much longer than they expected, and they commented how hopping around between family members’ homes while waiting for that right boat was a weird situation. It made them truly appreciate what it meant to have a home. “It’s an interesting situation when you’re questioning what the second act will be,” said Nancy. They went back to Houston, and then took a road trip out west to see the sights, and to visit family and friends while waiting for that perfect boat. They visited Las Vegas, the Grand Canyon, White Sands NM, many of the national parks in Utah and Colorado, and then went back to Texas. Winston makes his way to the upper deck. Meanwhile, St. Pete was still on their minds, so they came back and rented a place here for a couple months. At this point, they had visited the farmers market, rode bikes all around, made some friends, and had completely fallen in love with St. Petersburg. There was just a week before their lease was up and still… no boat. Seven months had gone by now and they started wondering if living on a boat just wasn’t meant to be. Then, things began to fall into place quite nicely. 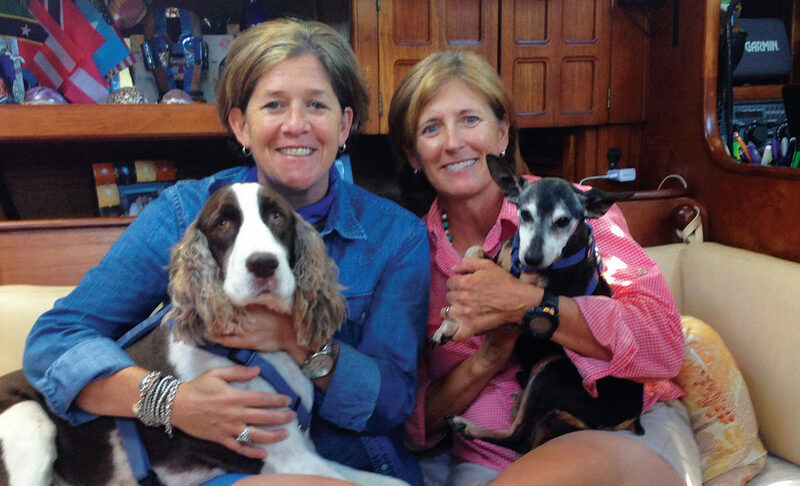 Nancy and Kelly ended up house-sitting for a new friend, ONE resident, Shelia King, when a broker called them up with good news; he had found an ideal boat for them on Marco Island. Sure enough, it was ‘the one.’ They were also fortunate enough to rent a slip at the downtown marina, which usually has about an 18-month waiting list. 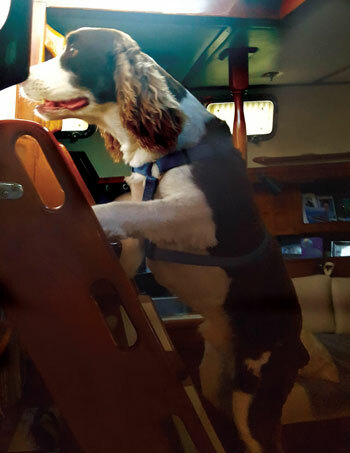 The two women and their two dogs have been living on a 40′ Endeavour cruising boat named Dance Aweigh since August 2015. 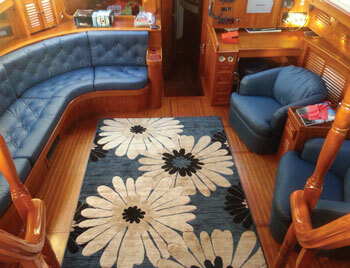 This center-cockpit, Bob-Johnson-design sailboat has a living space of roughly 600 square feet. 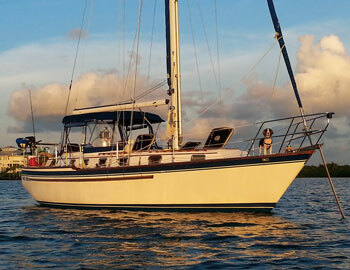 It has a full kitchen, two bedrooms, two bathrooms, and a navigation station which doubles as Nancy’s work desk. Most everything on board is multipurpose. There’s a lot of hidden storage space, but as a rule for them, when one thing comes aboard, one or two things have to go. It took four years to finally purge everything from their storage unit and they gave most everything to charity. Living the minimalist’s lifestyle now, they say they’re down to what matters most. One tough decision was what to do with their beloved new Tempurpedic mattress, but eventually they realized it was okay to cut it… literally. It now makes two beds in the Endeavour. Between the sailing in Tampa Bay, all the museums, festivals, sports, and having so many choices of things to do and places to go, they fell in love with St. Pete rather quickly. They decided to get jobs here related to their passion for boating. Nancy is a yacht broker and Kelly is a sales manager for a company that sells 100% toxin-free bottom-paints for boats. They also ended up buying a condo here for the future when they stop boating. They both feel very blessed. When they look out at the skyline, they enjoy the feeling of being in a city, the beauty of the buildings, the waterfront, the parks, and the marina. They both say that St. Petersburg is a diamond in the rough, a hidden gem, and that a lot of people cruising who come through to go to the Bahamas completely miss downtown St. Petersburg.